What was your very first Korean drama? What makes you fall into K-drama? For me, it because of the story and the actors. So, here's the list of old but GOLD Korean drama for you. Hope you enjoy it! ‘Almost paaaradise’ who doesn’t know this soundtrack? Boys Over Flowers or known as Boys Before Flowers is such an old K-Drama and I think BBF was my very first Korean drama I watched. It so popular on my elementary school era. I just didn’t know how old this drama is. But, it was released on January 5 – March 31, 2009. Starring Ku Hye-sun (as Geum Jan-di), Lee Min-ho (as Gu Jun-pyo), Kim Hyun-joong (as Yoon Ji Hoo), Kim Bum (as So Yi-jung), Kim Joon (as Song Woo-bin) and Kim So-eun (as Chu Ga-eul). This drama has a total of 25 episodes with romance, comedy, drama genres. BBF is actually based on manga series ‘Hana Yori Dango’ by Yoko Kamio. PLOT: Geum Jan-di is a girl from poor family who is by chance admitted to a prestigious private high school. She then meets the F4 group which leads by Gu Jun-pyo who is a spoiled heir to world leading conglomerate, Shinhwa. This is a modern Cinderella story about F4 friends and Geum Jan-di. Their love story grows from sadden to happiness. PLOT: Kill Me Heal Me is a romantic comedy drama between Oh Ri-jin and Cha Do-hyun. Oh Ri-jin is a first year psychiatrist while Cha Do-hyun is the son from a rich family who suffer with Dissociative Identity Disorder (DID) or has 6 others personality. Oh Ri-jin who helps Cha Do-hyun to recover from DID and his past memories began to fall in love with him. Everything on this drama was twisted with the fact of their old memories. 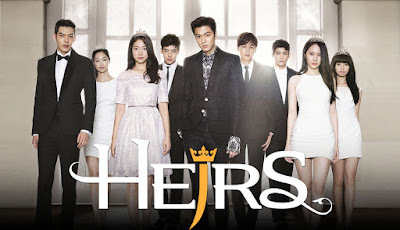 The Heirs or known as The Inheritors is a Korean TV series which starring Lee Min-ho (as Kim Tan), Park Shin-hye (as Cha Eun-sang) and, Kim Woo-bin (as Choi Young-do). This drama has 58-60 of running time and has 20 episodes in total. The Heirs was written by Kim Eun-sook and was released on October 9- December 12, 2013. PLOT: Cha Eun-sang lives with her mother who is mute. Her mother works as a housekeeper and Eun-sang works part-time jobs to help her mother. Eun-sang has an older sister who’s at university in America. One day, Eun-sang is going to U.S to find her older sister, however, what she finds in America is far worse than she could imagine. Both of them had a fight and her older sister takes Eun-sang’s money and runs off leaving her to cry. Kim Tan who sees everything unfold between Eun-sang and her older sister decided to help Eun-sang. After all of this moment, the love story between Eun-sang and Kim Tan begins. 49 Days is Korean drama that released on March 16 – May 19, 2011. Starring Lee Yo-won (as Song Yi-kyung), Nam Gyu-ri (as Shin Ji-hyun), Jung Il-woo (as Song Yi-soo), Jo Hyun-jae (as Han Kang), Bae Soo-bin (as Kang Min-ho) and Seo Ji-hye (Shin In-jung). 49 Days that also known as Pure Love has total of 20 episodes and was written by So Hyun-kyung. I’ve been watching this drama about 2-3 times and it successfully makes me cry. PLOT: Ji-hyun who will get married with Min-ho in just a few days but on her wedding day, she gets into a car accident makes her life full of sadness and makes her sleeping in comma for 49 days. A reaper known as ‘Scheduler’ gives her a second chance to live. In order for her to do that, she must collect 3 people who cry pure tears. Aside from that, 49 days also shows how evil Ji-hyun’s fiancé and Ji-hyun’s best friend, Shin In-jung was. Everything here was complicated until the end of 49 days. ‘Ups, Sorry.’ I like this drama! Cheon Song-yi was so funny on this drama and how both Song-yi and Do Min-joon love story makes me love this drama. This drama was directed by Jang Tae-yoo and has total of 20 episodes with 70 minutes of running time. 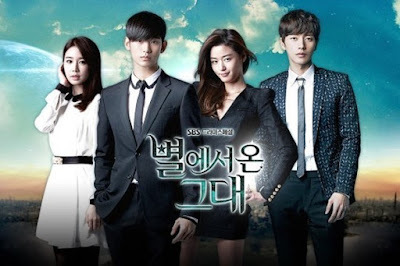 This drama was released on December 18, 2013 - February 27, 2014, featuring Jun Ji-hyun (as Cheon Song-yi), Kim Soo-hyun (as Do Min-joon), Park Hae-jin (as Lee Hee-kyung) and Yoo In-na (as Yoo Se-mi). PLOT: Do Min-Joon is an alien who landed on Earth 400 years ago during the Joseon Dynasty period. He will be able to return to his planet in 3 months but when he meets Cheon Song-yi, a famous actress, all the centuries he spent distancing himself from humans come to an end.